Free PDFs: Obscured Americans, Blue Threads to the Soul: Collected Poems of Linh Dinh. SUPPORT THIS PROJECT--Over 12,000 photos of Philadelphia, Albuquerque, Allentown, Ann Arbor, Ardmore, Ashland (PA), Atlanta, Atlantic City, Austin, Baltimore, Battle Mountain, Bellows Falls, Bensalem Township, Berkeley, Bethlehem, Bolivar, Boston, Bordentown, Boulder, Brooklawn (NJ), Buffalo, Burlington (NJ), Cambridge, Camden, Carbondale, Carlisle, Carmel, Cedar Rapids, Centralia, Charleston (SC), Charlotte, Chelsea (MI), Cherry Hill, Chester, Cheyenne, Chicago, Claymont (DE), Cleveland, Collingswood (NJ), Columbus, Cupertino, Daly City, Denver, Des Moines, Detroit, Dexter (MI), Dupont, Durham, El Cerrito, El Paso, Emeryville, Ewing Township (NJ), Fort Indiantown Gap, Fremont, Gary, Glassboro, Glenside (PA), Gloucester, Grinnell, Haddonfield (NJ), Hammonton, Harpers Ferry, Harrisburg, Hoboken, Houston, Jackson, Jersey City, Joliet, Kansas City (KS), Kansas City (MO), Kennewick, Knoxville, Lancaster, Langhorne, Laurel Springs (NJ), Levittown (PA), Lindenwold (NJ), Livonia, Los Angeles, Los Gatos, Marcus Hook, McCook, Media (PA), Millville, Milpitas, Minneapolis, Mount Laurel, Mountain View, New Haven, New Orleans, New York, Newark, New Harmony, New Holland, Normal, Norristown, North Charleston, Oakland, Old Forge, Omaha, Orlando, Osceola, Overland Park, Palmyra (NJ), Palo Alto, Pasco, Penndel, Pennsauken, Pine Barrens, Pittsburgh, Pittston, Portland, Providence, Raleigh, Redford (MI), Redwood City, Reno, Richmond, Richmond (CA), Riverside (NJ), Riverton (NJ), Roebling, Rutland, Sacramento, Salt Lake City, San Antonio, San Bruno, San Francisco, San Jose, San Leandro, San Mateo, Santa Clara, Santa Cruz, Santa Monica, San Xavier del Bac, Sausalito, Savannah, Scranton, Somerdale (NJ), South San Francisco, Springfield (IL), St. Louis, St. Paul, Steelton, Stockton, Stratford (NJ), Sunnyvale, Taylor (PA), Trenton, Tucson, Union City (NJ), Ventnor, Vineland, Washington, West New York, Westmont (NJ), Wichita, Wilkes-Barre, Williston, Wilmington, Wolf Point, Woodbury (NJ) and Youngstown, etc. Outside USA: Akreiy Ksatr, Alforja, Arles, Barcelona, Batam, Ben Cat, Ben Tre, Berlin, Beziers, Binh Chanh, Binh Duong, Brighton, Bu Dang, Budapest, Buon Ma Thuot, Burgazada, Cai Be, Cambrils, Can Tho, Castres, Certaldo, Chanthaburi, Chau Ly, Chu Se, Cu Chi, Da Huoai, Da Lat, Dresden, Ea Kar, Ea Kly, Ea Nuoi, Florensac, Frankfurt, Girona, Gorlitz, Grimma, Hanoi, Halle, Hong Kong, Istanbul, Johor Bahru, Juarez, Kawasaki, Kiev, Kinaliada, Krong Buk, La Gi, Lap Vo, Leipzig, London, Long Xuyen, Luban, Markkleeberg, Marseille, Matsudo, Mexico City, Montreal, Nha Trang, Olargues, Osaka, Phan Thiet, Phnom Penh, Phuoc An, Prades, Prague, Puigcerda, Quy Hop, Reus, Reykjavik, Ripoll, Rivne, Saigon, Salou, San Juan Teotihuacán, Sete, Singapore, Soc Trang, Taipei, Tarascon-sur-Ariege, Tarragona, Tepotzotlán, Thanh Mai, Thep Nimit, Thuan An, Thuan Nam, Tokyo, Toluca, Toronto, Toulouse, Van Loi, Vic, Vinh Chau, Vinh Long, Vung Tau, Wegliniec, Wurzen, Zgorzelec. If you have a PayPal account, you can save me the fees by sending money directly to my email address: linhdinh99@yahoo.com . Thanks! 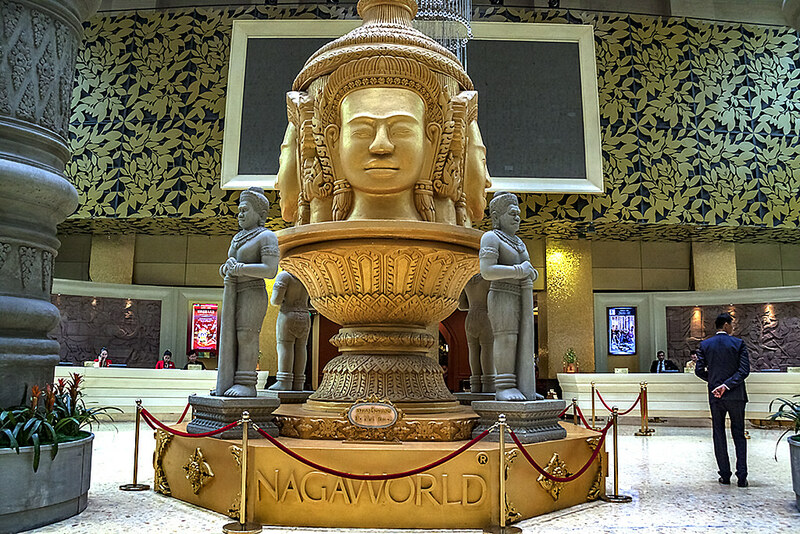 Nagaworld is a casino, five-star hotel, a handful of restaurants, plus luxury shops. Owned by a Malaysian Chinese, it bills itself as "The Mekong Region's non-stop entertainment capital." Most of its clientele are mainland Chinese. Born in Vietnam in 1963, I lived mostly in the US from 1975 until 2018, but have returned to Vietnam, where I live in remote Ea Kly. I've also lived in Italy, England and Germany. I'm the author of a non-fiction book, Postcards from the End of America (2017), a novel, Love Like Hate (2010), two books of stories, Fake House (2000) and Blood and Soap (2004), and six collections of poems, with a Collected Poems apparently cancelled by Chax Press from external pressure. I've been anthologized in Best American Poetry 2000, 2004, 2007, Great American Prose Poems from Poe to the Present, Postmodern American Poetry: a Norton Anthology (vol. 2) and Flash Fiction International: Very Short Stories From Around the World, etc. I'm also editor of Night, Again: Contemporary Fiction from Vietnam (1996) and The Deluge: New Vietnamese Poetry (2013). My writing has been translated into Japanese, Italian, Spanish, French, Dutch, German, Portuguese, Korean, Arabic, Icelandic and Finnish, and I've been invited to read in Tokyo, London, Cambridge, Brighton, Paris, Berlin, Leipzig, Halle, Reykjavik, Toronto, Singapore and all over the US. I've also published widely in Vietnamese.